Edvar van Daalen (October 17th 1977), born and raised in Almelo as member of the family: Mom and Dad van Daalen and brother Arvid. Daniëlle Horenberg (April 19th 1976), born and raised in Raalte as member of the family: Mom and Dad Horenberg and brother Jarno married to Marion and recently little nephew Sven. On January 29th 2005 our lives crossed for the very first time: Daniëlle was accompanying Ivo, Edvar’s colleague, at the annual party of Antares, an ICT company in Nieuwegein. At diner we curiously glanced at each other, but during a game of Tokyo (rolling dices) the spark of love really kicked in. Even though you are an independent woman, a mysterious man can make you very nervous. So, to make a good impression, you just throw your glass of red wine over his trousers . Of course, this offered Edvar a nice excuse to get in touch with Daniëlle after the party to let her know that the trousers survived. After emailing for half a year a second meeting was arranged to view Edvar’s pictures of Japan. Edvar is well-known for his journeys, his love for nature and of course Ferraris. He likes photography and also plays volleyball once in a while. If you look at this Photo Gallery you will get the picture. Daniëlle is a biologist, shares Edvar´s passion for nature, plays squash, got her PADI diving license and her motorcycle license recently and works as a medical advisor at a pharmaceutical company. After a number of dates the first kiss was a fact on November 20th 2005 and our relationship has been perfect ever since. Following a final holiday on our own, Daniëlle skiing with the girls (Gitte, Ariena, Béate, Noor and Judith) and Edvar by himself to Australia, a final relationship test arrived: our first holiday together, to Peru. A dream of a trip around the world already popped up early in our relationship, but will you still like each other after a couple of months? Daniëlle just started a new job and wanted to work there for at least a year. And how does it work when you are together on long holiday? Late August 2006, on the way back from Peru, we made our decision: we really are soulmates and want to go on a trip around the world together. We both quit our jobs in November, and the preparations could start! Long journeys like a trip around the world require a proper preparation. Not only regarding the trip itself (flight tickets, visa, vaccinations, etc. ), but also regarding the situation at home (job, house, finances, etc.). Luckily, we are not the first persons to travel around the world, so it’s quite easy to find information about a proper preparation. To help future travellers, we decided to make a web page about our own preparation. Of course, it’s completely focussed on our own way of travelling and also on the situation here in The Netherlands. Subjects which are only applicable to people from The Netherlands, will be omitted from this English version. If you still want access to the information, you can switch to the Dutch version of this page. NOTE: This information is related to our own preparation, made in late 2006 and early 2007. Some information was altered/added after we returned from our trip (late 2007). So, please understand that specific information might be incorrect because of changes regarding (for example) laws or insurances!! This also applies to the situation in the countries we visited, for example regarding the prices. Lonely Planet. Worldwide-famous books. Perfect for backpackers to find information about specific countries and regions, but also to find nice hotels or restaurants. As an alternative, try the series of Rough Guide. BolletjeOm. Interesting website made by two world travellers. Site is in Dutch and English. JoHo. Dutch organisation focussed on travellers. Site is in Dutch and English. Compared to (for example) US citizens, the Dutch employees can easily take some days off. But it’s harder when you want to travel for six weeks or more. Maybe you can choose for a sabbatical. Or just quit your job. That was our own solution. However, this also means no money and no certainty about work in the future. But we both have a decent background (education and job experience), so we are not worried about that. After our trip around the world, we shouldn’t have too many problems to find a new job. Also note that quitting your job might also affect your future regarding pension, health insurance and so on, but that really depends on where you live. Do some more research, as it’s quite important. If you own a house, you can decide to sell it, or to rent it to others. If you rent a house, you also might be able to rent it to others for a while, or just stop renting it. It’s hard to say more about this topic, as it really depends on the country you live in and on your personal situation. Regarding our own situation: Edvar was renting an apartment, which was easy to stop. Daniëlle owned an apartment, which was sold during our trip around the world. Also think about the other things you own, like a car or all the stuff in your house. Maybe you can sell some things or store it at parents or friends. There are also plenty of companies where you can store your stuff. Use Google for more information, including tips about moving. Long journeys aren’t cheap, also because you might have no (or a very limited) income. So, save some money, win a lottery, get a heritage, or find a lost treasure. You can also work while travelling, but don’t forget that it’s not easy to get a job (you might need working visa) and often for a minimum wage. The short answer: our trip around the world cost around €30000 (€15000 per person). That’s including everything, so all hotels, food, flight tickets, all other transportation and all other costs. We are no low-low-budget travellers, like some comfort (so, limited nights in dorms), travelled large distances and participated in many excursions. If you want to do it a lot cheaper, go to South and South-East Asia. With €7500 per person you can stay there for a long time, especially if you don’t travel too far and if you don’t do expensive activities. The long answer: Below you will find an overview of all countries and the amount of money we spent over there. It’s divided in two parts, the basic costs (food, accommodation and transport) and extra costs (like excursions). However, it’s excluding costs like international flights, equipment (like backpack, clothes, photo equipment, etc. ), travel books and visa. Accommodation: In all countries, we mainly spent the nights in cheap hotels, based on double occupancy. In New Zealand and Canada we stayed at hostels, but often in private rooms (no dorms). Food: All food and drinks, including small groceries. We mostly ate in cheap restaurants. In New Zealand and Canada we often bought our own food and prepared it at the hostels. Transport: In New Zealand and Canada we had a rental car. In the other countries we used public transportation, like bus, taxi, metro, train, riksha and boats, depending what was available. See the extra costs for things like national flights. Other: Other small costs, like tips, entrance fees and internet. All costs are p.p.p.d., so per person per day! Black Water Rafting € 140 p.p. Walking with Wolves € 85 p.p. Flight Tulear-Tana € 185 p.p. Bus (24 hours) is € 40 p.p. Flight Varanasi-Nepal € 33 p.p. Tibet tour € 100 p.p. Regarding money during the trip: always carry some cash (local currency and some US dollars or Euros; not too much, of course). Use different wallets to keep your money (one you actually use with limited cash and another one with your cards which you can keep in a safe place). Most countries have ATMs available where you can get cash. Use cards which are accepted in many places. Credit cards are also a good choice, but this also depends on the countries you want to visit. VISA is the best choice, especially in Madagascar where you can’t do without VISA. In our opinion, Traveller Cheques are not really necessary these days. Also make sure that somebody back home can take care of your financial situation. Ask your bank for more information about the possibilities to perform financial transactions using Internet banking. Always take care of yourself, so make sure you have a good health and travel insurance. Insurances really depend on the country you live in, but you might check JoHo for some basic information about it. Ask tax agencies in your own country for more information about the consequences of such long holidays. Vaccinations. Some of the countries that we are going to visit require a Yellow Fever vaccination. It’s also strongly suggested to have vaccinations to prevent Hepatitis A, DTP and Typhoid Fever. We already have most of them because of previous travels (except Typhoid Fever), and we will also add a vaccination to prevent Hepatitis B. Finally, we need a “Cholera not indicated”-stamp to visit the African countries. Malaria. A well-known dangerous disease spread by mosquitoes. Don’t underestimate this disease! We are going to use DEET and correct clothes to prevent most mosquitoe bites. We also used Lariam (Mefloquine) and had no problems with it. Tip: try three pills of Lariam before you start your trip, to find out if you experience any side effects. Always carry a decent First Aid Kit and some basic medicines (Non-Aspirin Pain Killer, plaster, bandage, ORS, iodine, Imodium, etc.). Also think about things like condoms and birth control pills. Also visit your dentist before you go on a long holiday. Make sure that he and your doctor have the correct contact details. You often need to use your visa within a limited amount of time (often 3 or 6 months). Arranging visa long before you visit the country therefore doesn’t make sense. This also means that you might be forced to arrange certain visa during your trip, or when you enter the country itself. If you have to arrange visa during your trip, prepare yourself by checking the regulations on websites from visa agencies or from embassies/consulates in your own country. Also bring some passport photos and cash in the currency that the embassies accept. Search the Internet for addresses of embassies and consulates in the countries that you are going to visit. Some countries require proof of booked hotels/trips or proof of flights for the departure of the country, to be able to get a visa. For example, just having a single flight to a country (without proof that you will leave the country one day) might raise problems. This all depends on your own wishes, your time, your possibilities and your money. You can walk, use a bicycle, rent a car, travel by airplane or use public transport. It’s very personal, so just search the Internet for lots of information and make your own dreams come true. As we wanted to travel for 8 or 9 months and as we already had a list of countries that we really would like to visit, we choose for this route. In our eyes, these countries have an appealing culture and nature. One month for each region should be enough to see the highlights. However, we are aware that it’s impossible to see everything and also that we would like to travel in a relaxed way. This means that we haven’t arranged more that just the international flights, which makes us more flexible to do whatever we want. If we want to relax on a beach, we will simply do that! When dealing with large distances, using the airplane is a good solution. If you don’t want a tight schedule, you can arrange your flight ticket just a couple of days in advance. If you are lucky, you can find some cheap offers, but sometimes you might have to wait a couple of days, because planes are fully booked or prices are sky-high. Also remark that single flights are almost as expensive as a roundtrip and that certain countries require a roundtrip ticket as proof that you are also going to leave the country one day (see passport and visa). 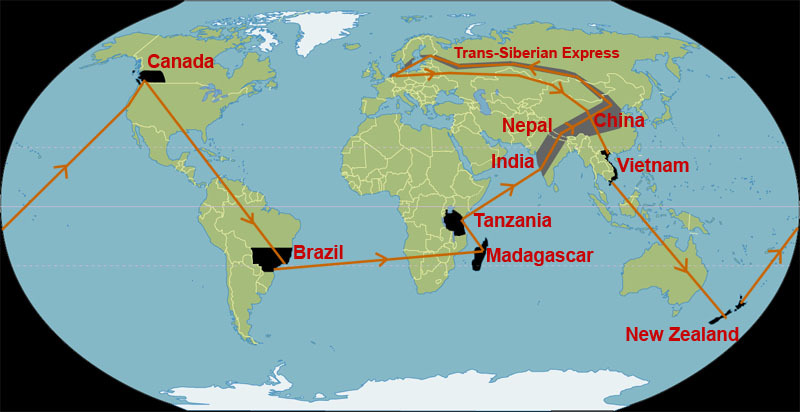 However, if you already know your route, think about Round-The-World Tickets (RTW Tickets). There are several possibilities, but make sure you read ALL terms. Sometimes you have to travel in one direction, sometimes you may visit a continent only once and there are often limitations regarding the number of flights or the number of miles. For more information (in Dutch! ), check Kilroy Travels, where we booked our own tickets (RTW tickets of the StarAlliance Group). What should you take with you when travelling for such a long time? We are not going to invent the wheel again (Dutch saying), so search for websites with useful “What to Bring”-lists. For the Dutch, check the lists at JoHo. (Snail-)mail. It’s not quick, it’s expensive, but it’s also a cute way to stay in touch with family and friends, especially if they still don’t know what the “Internet” is. Besides that, it’s a good way to send packages, for example with souvenirs. Email. Just perfect: fast, cheap, almost everywhere available and easy if you want to stay in touch with multiple persons. For free email addresses, check sites like Yahoo, Hotmail, GMail or Ekit. Website. Nice if you want to stay in touch with a large group of persons, including the “unknown”, also an easy way to share pictures. You can build your own website (like this one; see below for more info), or use services like TravelPod or TravelBlog. Surf the net for similar services. Phone. Phonecalls from other countries are often very expensive, especially from hotels. Sometimes CollectCall is possible (the receiver will pay). We have used Ekit, a good solution for certain countries. But just check what’s possible in the countries that you’re going to visit. For example, in India there are lots of “phone shops” where international calls are very cheap. It’s also possible to call by using the internet, but in many cases the quality can be disappointing, as you need a quick connection. Mobile Phone. Nice if you want to be able to call (or receive calls) from as many places as possible, but understand that the mobile phone networks in poor countries aren’t as perfect as in certain European countries. Mobile phones can now be found in most countries, but it depends on your own provider if you can call or not. It’s also very expensive. Persons with Dutch mobile phone services will often pay 1,50 to 2,50 euro per minute, also when you receive calls. If you are staying in one country for a long time, think about buying a SIM-card over there. Otherwise, try TrendCall, which we have used. Receiving phone calls often costs 20 eurocent per minute, calling costs 60 eurocents (depending on the country). In some countries it worked, but we also had a lot of problems with the Callback-function. So, not perfect. For alternatives, check the website of PrePaidGSM. Hosting. The website is hosted by Sohosted. This costs 1,50 euro per month, plus 14 euro per year for the .com domain name. Hosting is including PHP (ASP and CGI are also possible) and MySQL or Access databases. Sohosted also offers a nice and easy control panel. Blog-software. There are multiple free packages available. Most of them are based on PHP with MySQL, so you need some knowledge of those topics. This site uses the software from Wordpress, with lots of additional plugins like Polyglot (bilingual), FAlbum (photo gallery), GeoPositions (links to Google Maps and so on), WeatherIcon (local weather) and several others. Note: a lot of customizing was necessary to use this look and to use two languages. To upload pictures during the trip, this website uses the Wordpress plugin FAlbum. The pictures themselves are hosted by Flickr. Subscription to Flickr only costs $2 per month, giving you enough space for lots of pictures and no worries about software to upload or resize pictures. Integration with your blog is easy, including a nice slideshow. If you don’t need integration, check Webshots as alternative. Start early to check how to stop subscriptions (like from magazines) and insurances. It’s not always possible to stop it whenever you want. Buy an International Drivers Licence. Some countries require this as an addition to your own drivers licence. Make copies and digital scans of important documents (passport, visa, drivers licence, insurance papers, flight tickets, serial number of photo equipment, phone numbers, addresses, etc.) en make sure that you can reach them by using the internet. Several organizations (like Ekit) offer a kind of digital safe. Below you will find an overview of all regions we wanted to visit and their highlights. The actual trip was almost exactly as planned!